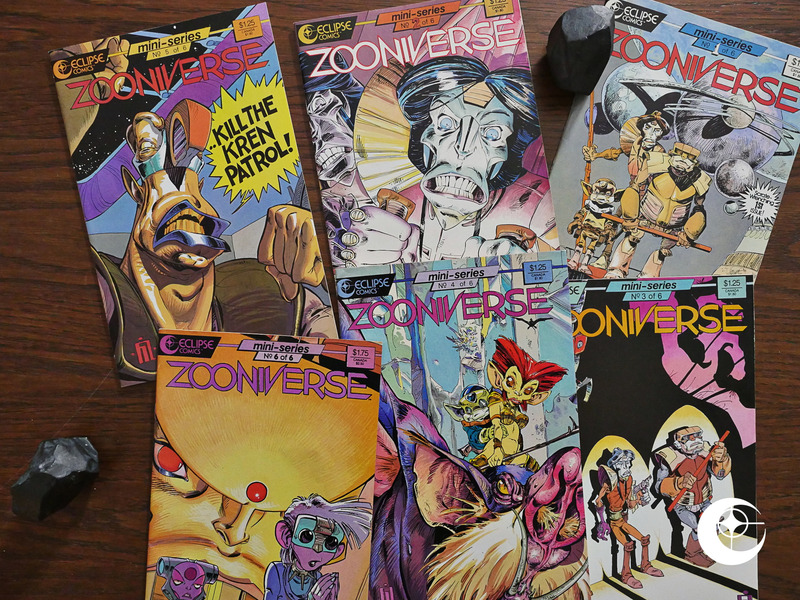 Zooniverse (1986) #1-6 by Fil Barlow et al. 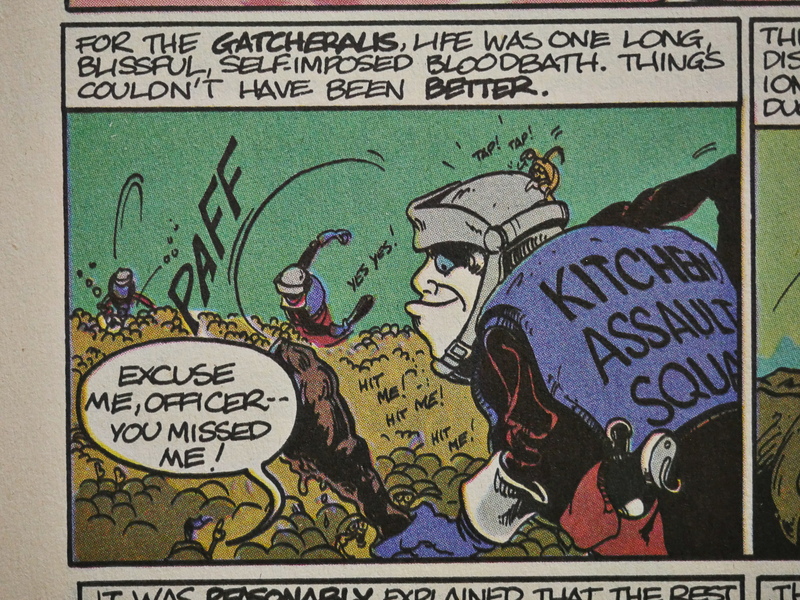 This is a comic I didn’t read at the time, but the name “Fil Barlow” and that art style sure looks familiar. 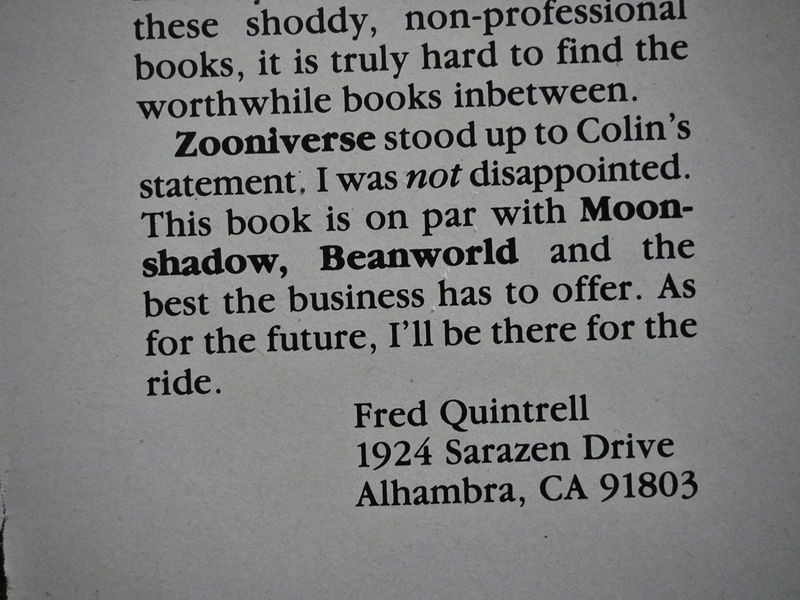 Did he appear in a lot of anthologies at the time? Doesn’t seem like it, so I have no idea why it all looks so familiar. Anyway, this is published by Eclipse, but it’s packaged by Minotaur Books out of Australia. 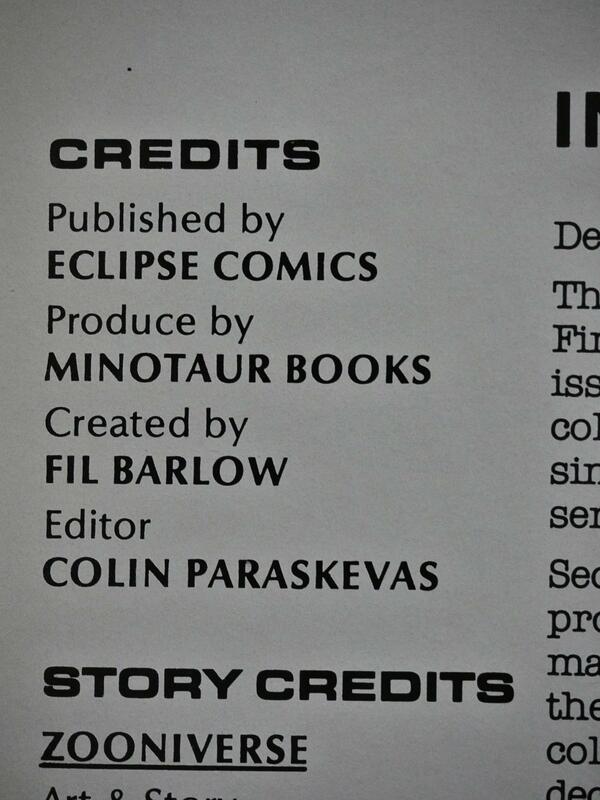 This means that in most of the issues, the normal Eclipse editorials and ads are missing, and instead we get a jam-packed er package of comics, with Barlow doing the main feature, and other (Australian) artists filling out the backstories of certain characters or species. My first impression upon reading this was that Barlow sure looks like a fan of Valérian et Laureline by Pierre Christin and Jean-Claude Mézières. 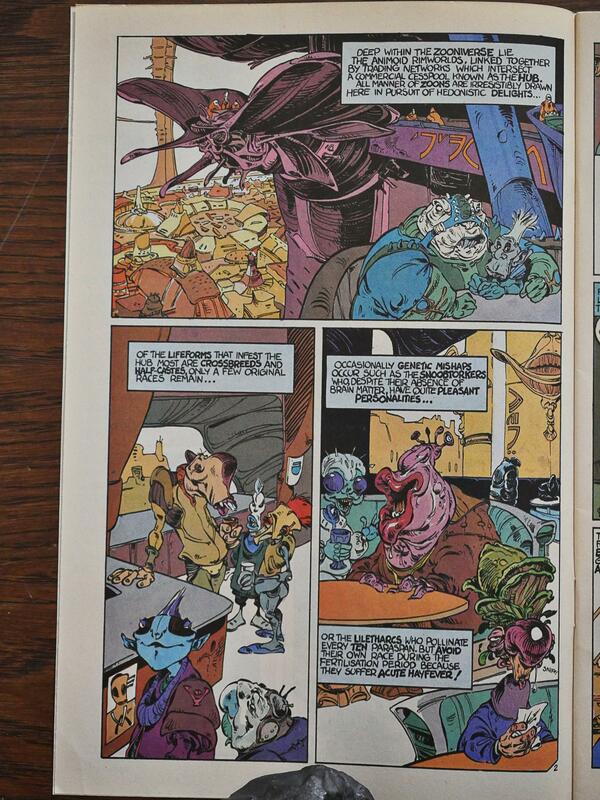 Especially the creature design is tends towards being very Mézières-like. But there are also other influences. 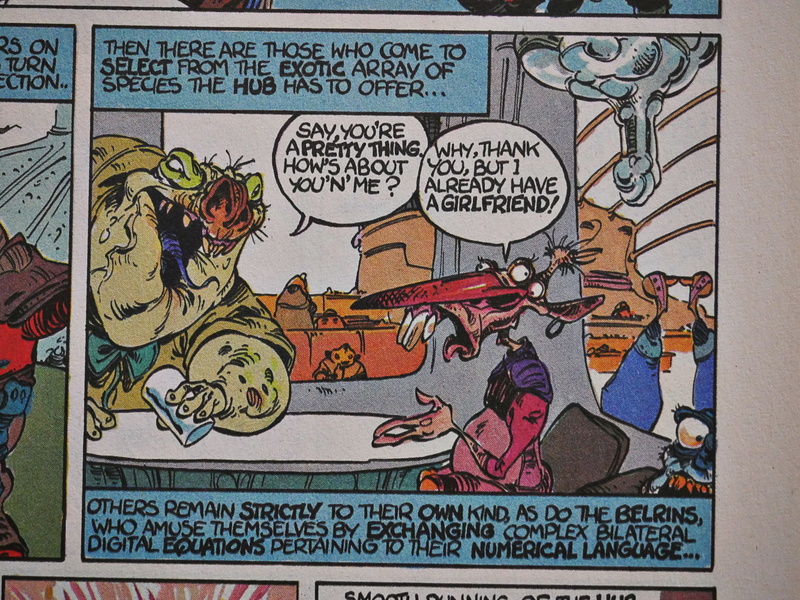 That guy with the girlfriend looks like a Basil Wolverton chap, right? 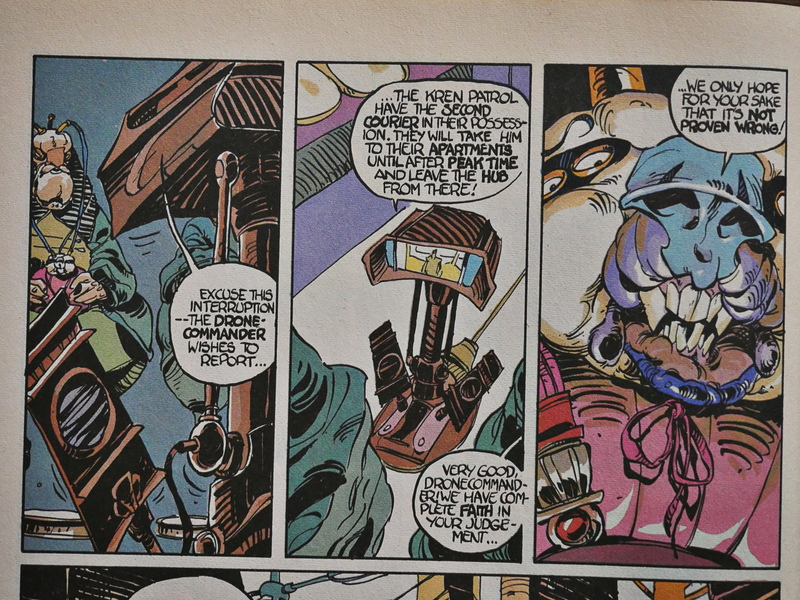 Unfortunately, while Barlow’s creature design and artwork is very pleasing to look at, his storytelling is a bit on the confusing side. 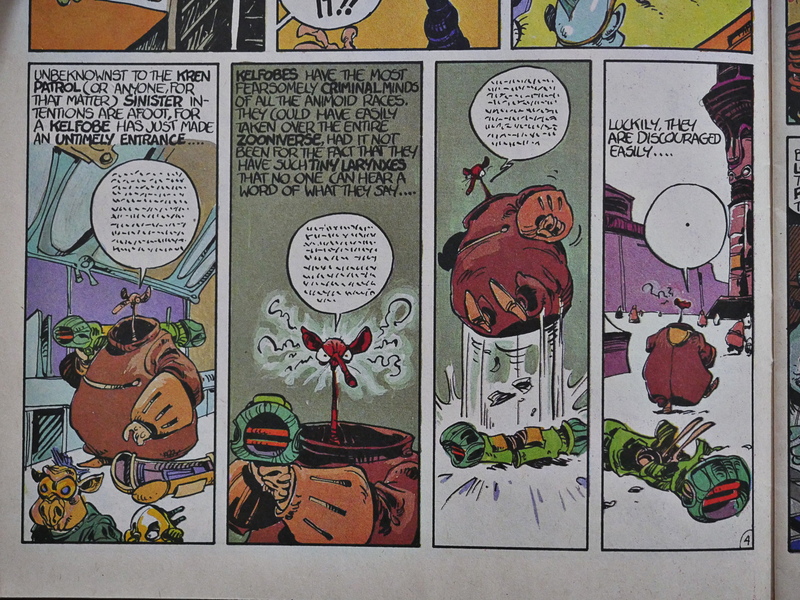 The 180 degree turn done before establishing what’s going on, without showing what the scale is, without the reader being familiar with what these characters look like, with inconsistent colouring, means that sequences like this are pretty much unreadable. Looking at it now, after finishing this series, I understand what’s going on: Those guys in green are huge, and they have these normal-sized people (in pink) connected to their heads via those wires, and that mechanical thing probably has a person of normal size within it? There are so many scenes like this. A reader complained about things not being explained, and the editor snapped back with something about not spoon-feeding and infodumping, and that’s true on a larger scale (we don’t need to know everything to enjoy the story), but when you can’t tell what’s going on on a panel-to-panel basis, it’s just fatuguing. While Barlow has invested a lot in creating fun species, it’s not all completely original. 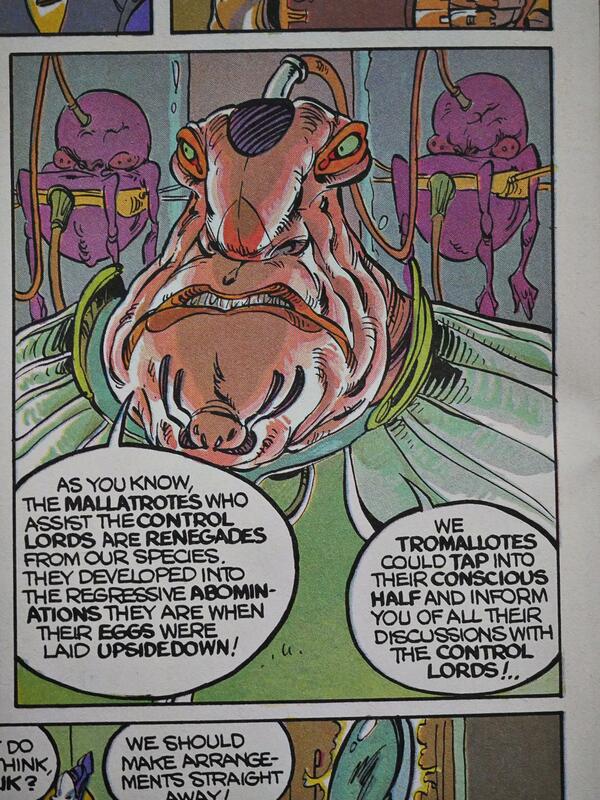 For instance, above we have the Gacheralis, who are obsessed with having other people eat them. Which has been done many times before, both in SF and not. 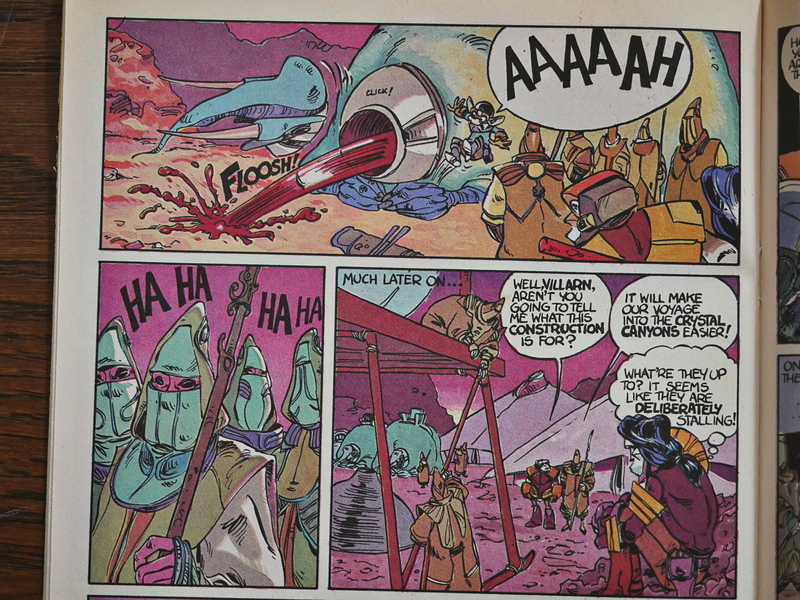 Some species are just introduced as a gag, like this Kelfobe, who only appears in these four panels. Nobody hears its threats, so it gets frustrated and jumps up and down on it’s rifle and leaves, never to be seen again. It’s not just panel transitions that are weak: The action is headache-inducing as well. I can see what he’s going at in this gag: A twice-over absurd reversal of payment to threats to rewards back to payment again, all Marxian and stuff. 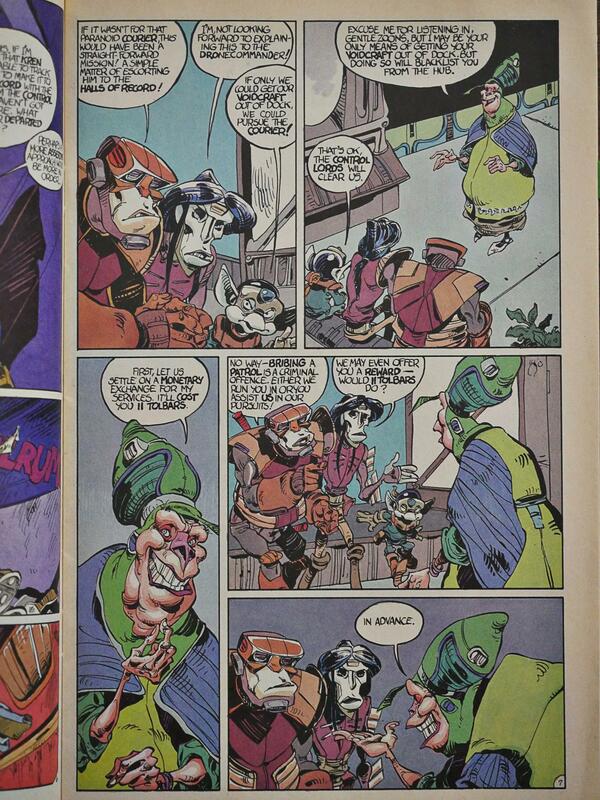 But it doesn’t work: The Kren patrol (the three guys) starts off the thing by accusing him of trying to bribe them, but he didn’t do that: He said he wanted payment. Did a speech balloon or two go missing? Barlow has obviously a lot of backstory and technical detail about the universe… and he seldom stops telling us about it. 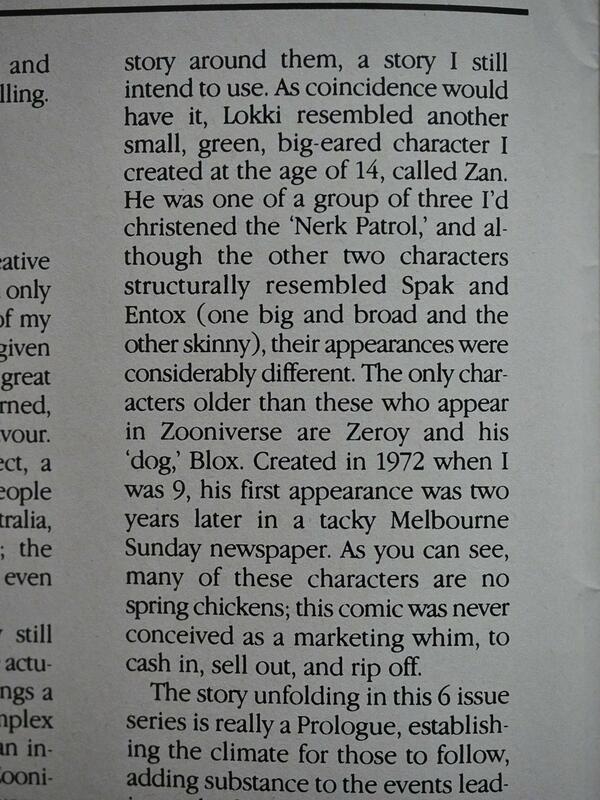 There are these infodumps every third page, despite the publisher’s protestations otherwise. Hm… Beanworld? Wasn’t I supposed to do Beanworld in this blogging series? Did I forget? Hm… Aaargh! I’ve got it misclassified as starting in 1989, while it really started in 1985! Oh my OCD. I’ll do it next, then. A big thing with red fluids pouring out, with a green creature flying over the red fluid? And then they all laugh? I had to flip back and forth a couple of times to get the gag: The big green thing is the elephant-like slug they were riding, and pulling the lever cut its head off (so that’s not a new, separate creature flying there), and that’s the gag. It’s probably all my fault! I’m stupid! 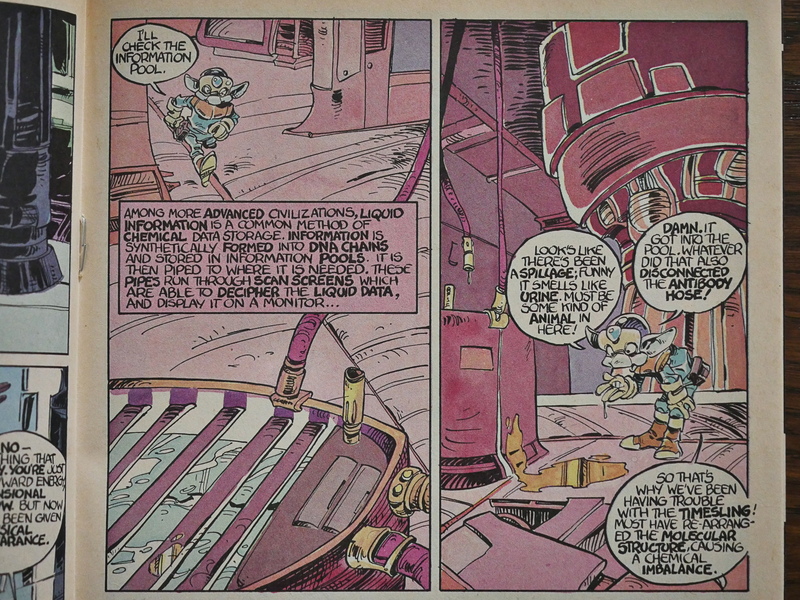 Barlow writes a couple of introductions late in the series where he explains that he’d been working on this universe since he was nine, which explains why he’s cramming everything in here. 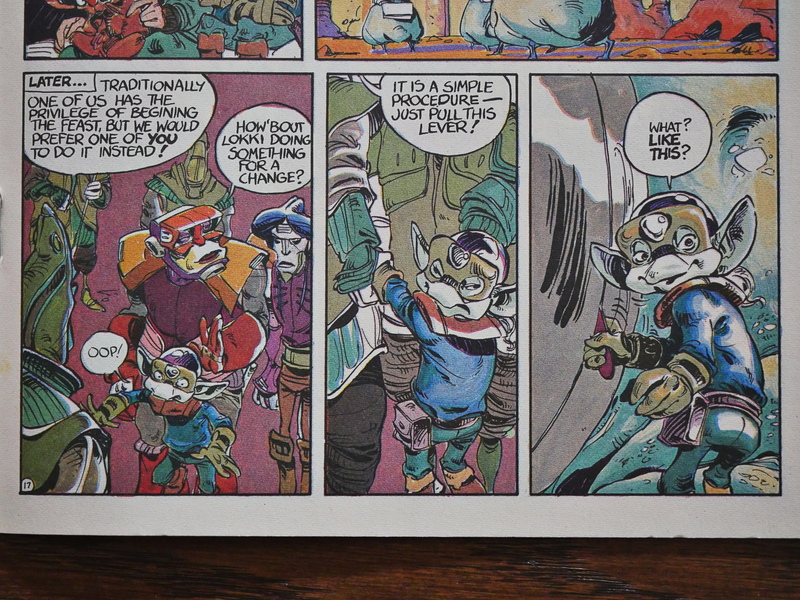 The publisher mentions the colouring a lot, and it is really nice. 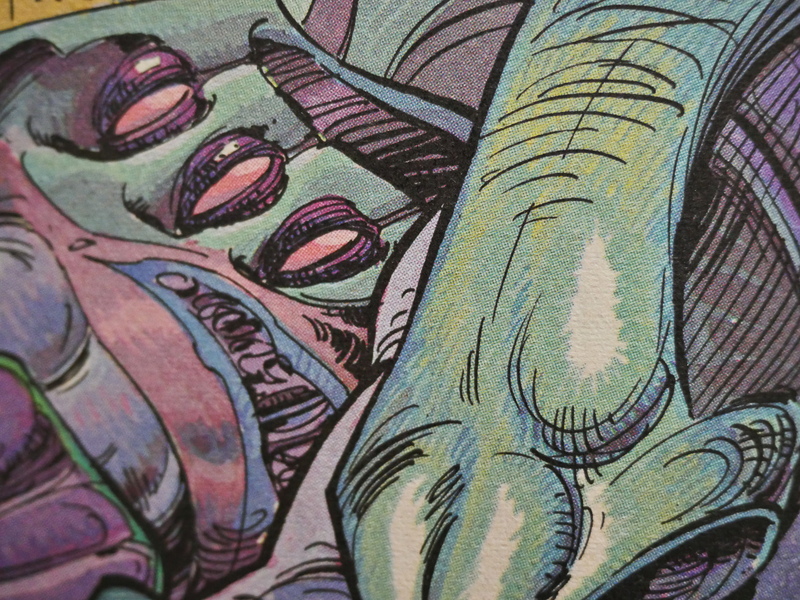 Here’s just a tiny detail from a panel: Look at all those little details in the colouring job. Nice. 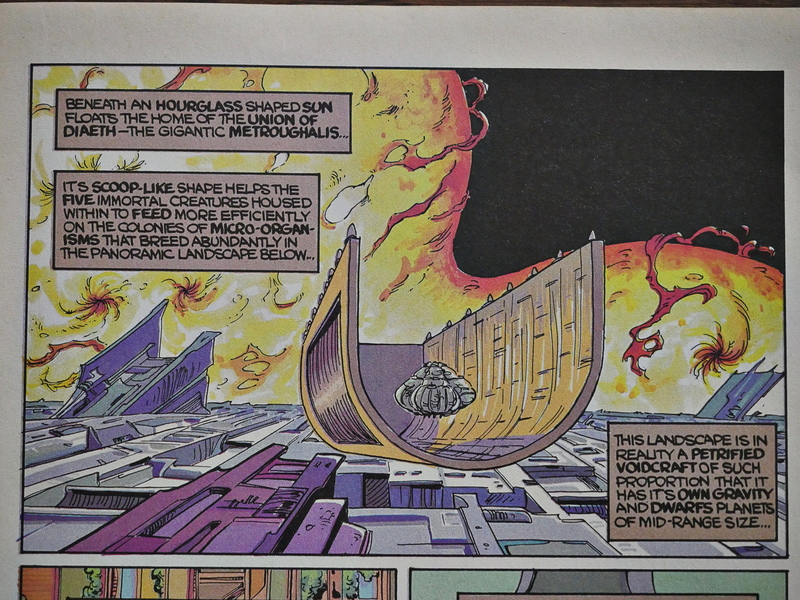 It brings a lot of depth and (sur)reality to the pages, but most of all, it just looks all pretty and stuff. 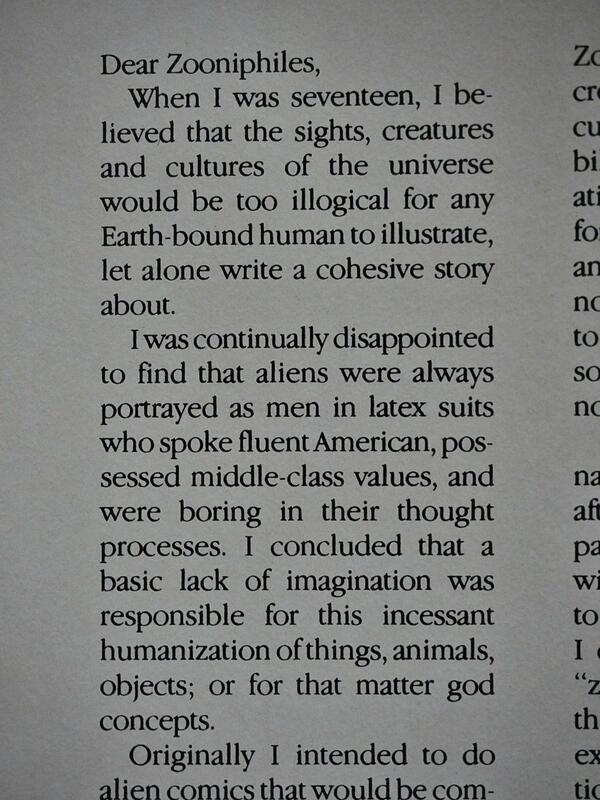 Barlow explains further that he wanted to create something that was more truly alien than the usual sci-fi. And succeeds there. Not too many people have done hourglass-shaped suns. As you know, Bob, just let me explain the plot. Or rather, let’s not: It’s a pretty fun and appropriately complex story about various factions and plots and counterplots. Despite certain frustrations while reading the book, it’s an intriguing concept that could be developed endlessly. It ends on a not completely satisfactorily: It leaves one of the characters apparently randomly forgotten in jail while it ties up the rest of the plot strands. 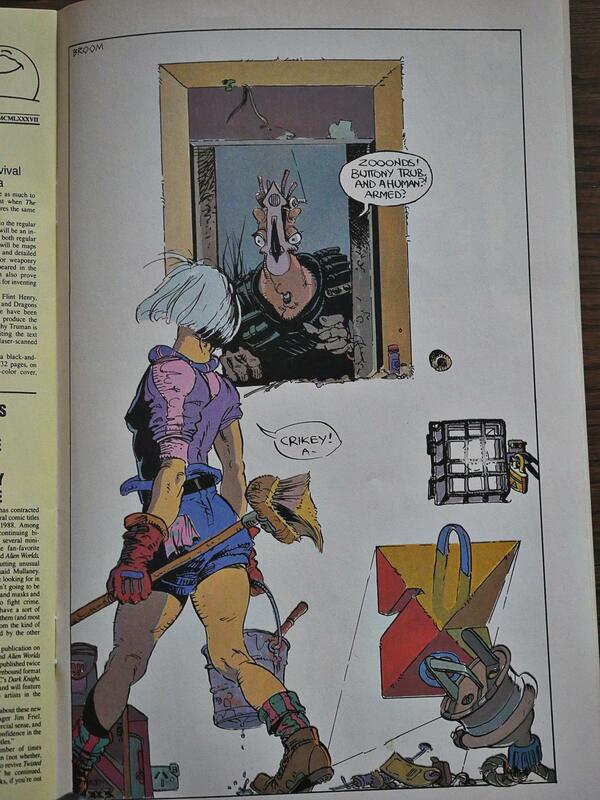 I wondered for a second whether they’d got William Kaluta to do one of the backup strips, but it’s Steph Campbell. However, to my mind, the best part of-this issue is the return Of Fil Barlow’s Zooniverse in the form Of a new storyline entitled “The Zooniverse Cycle: Lifeworks.” Barlow’s original American exposure came in Eclipse’s six-issue mini-series Zooniverse, and it remains one of the best, most original works of comics and sci-fi invention ever to grace the printed page. It was otherwise apparently not reviewed there. Barlow went to work in animation shortly after this was published, and worked on stuff like Alf, but he’s been doing Zooniverse stuff once in a while. Hm… Oh! Now I know why Barlow’s work looked so familiar! I had read the Island anthology (published by Image comics) a couple of years ago! I think I basically skipped it there, because I found it too exhausting to read.